I am so excited.....did you see my new blog address? I am now www.joyofkindergarten.com. I have been trying to figure out the directions to set this up for days. It is far beyond my computer abilities...that is for sure!! So I would like to have a little weekend giveaway. 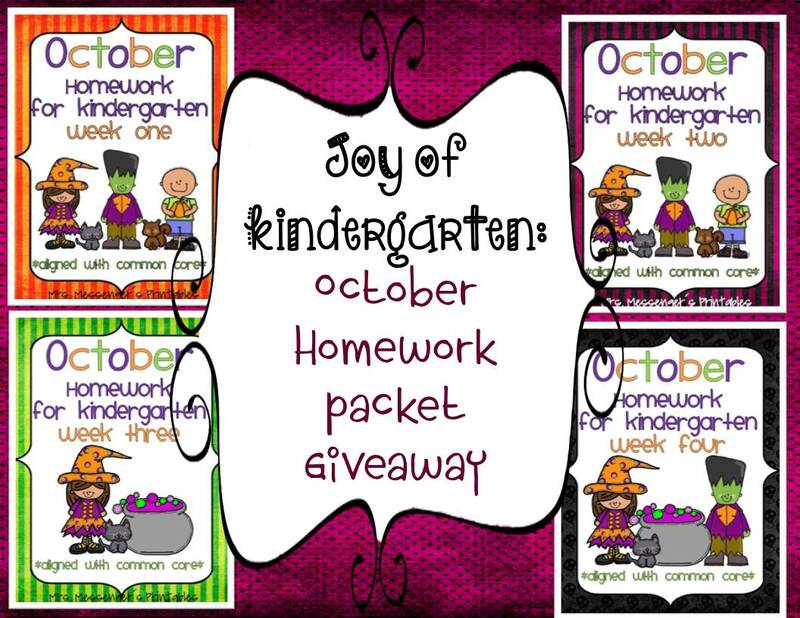 I am giving away one set of my October Kindergarten Homework Packet. 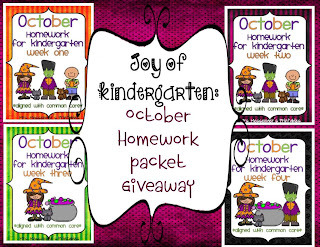 It includes 4 weeks of homework with an October theme. Although I designed it with homework in mind I think it would also be awesome as morning arrival work, or something to do for kiddo's who finish early. We will be doing lots of craftivities and reading Halloween stories! This year my class will be reading lots of spooky stories and acting out the 5 little pumpkins! oh yes, we will paint too. We will have a Literary Costume Parade and a Fall Party on Halloween. We will also be completing a mini unit on pumpkins, reading books about pumpkins, and carving our pumpkins into Jack-o-Lanterns. We can't have "Halloween" parties per se......so we do "Fall Rotations" on that day. We have 6 K teachers and each class will rotate to all 6 classrooms for a 30 min. time during the day. Each room will have a different activity planned......snack, craft, story, games, etc. It's really fun and the kids LOVE switching classes that day!!! We will be doing Halloween activities from my Halloween fun unit. We are so lucky to get to dress up all day so we will be doing different activities that involve our outfits! I love your clip art!! The free football set was great!! We will be having lots of fun with fall and pumpkin activities. reading halloween stories, making halloween masks and pumpkin carving!! I am a follower and a fan! My three classes (K-2 I teach only reading) will be celebrating with a Fall party. We are also dressing up as our favorite story character. Our school is having a contest to see which class comes up with the best story character pumpkin! We're doing some Halloween stories this coming week and the next week. (It's a short week because of conferences). On Halloween, our kids will dress up and we'll parade through the middle school and high school classrooms in our building (K-12 charter school), and a Halloween party will follow! We are not allowed to "celebrate" Halloween in school, so we just read Halloween themed books.